“In Thurston County, wildland fire is the most frequently occurring hazard, seeing an average of 70 wildland fires per year.” So begins the County’s web page regarding how you can make your home more secure during wildfire season. We don’t think of wildfires in our part of Western Washington, but as the summers become drier it may be prudent to familiarize ourselves with some basic changes we can make in order to build a defensible space around our homes. 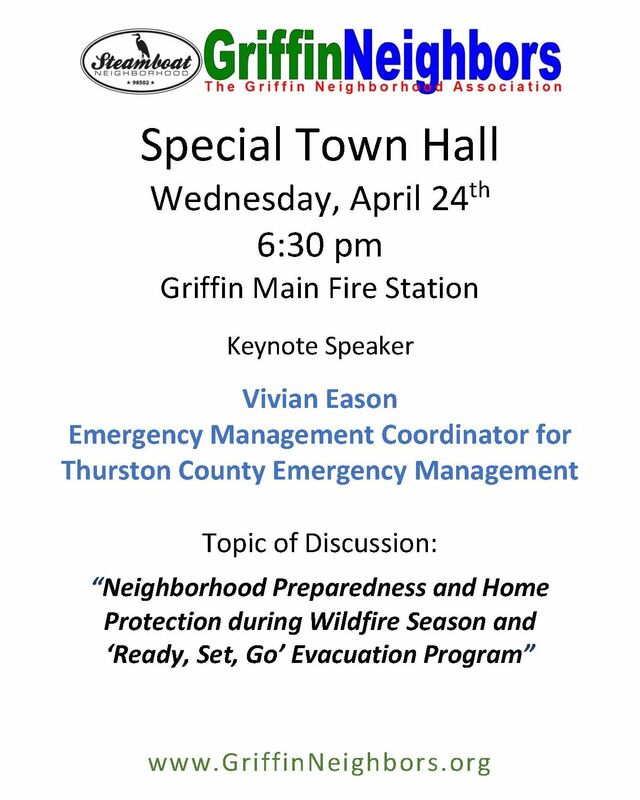 On Wednesday, April 24th the Griffin Neighborhood Association will host a presentation by Thurston County Emergency Mangement on the topic of “Neighborhood Preparedness and Home Protection during Wildfire Season and the ‘Ready, Set, Go’ Evacuation Program.” We hope you’ll join us. The National Fire Protection Association has created an informational program called “Firewise.” Their website contains a wealth of useful materials for homeowners in rural areas such as ours. This page, in particular, describes the concept of the “home ignition zone” as a means of describing how controlling fuels can build a natural defense protecting homes and outbuildings from wildfire. From five to 30 feet, tree spacing and creating breaks in lower vegetation provides the greatest benefit. For more details about these three zones, click here. Firewise is on Facebook, too. 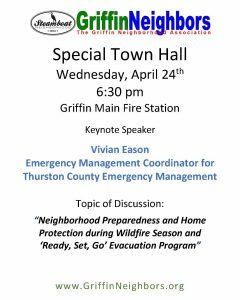 At this month’s Town Hall meeting, Vivian Eason, Emergency Management Coordinator for Thurston County Emergency Management, will also speak about the County’s evacuation plan. One important step you can take to help in an evacuation is to sign up for emergency alerts and notifications. Click this link for more information about the kinds of alerts available and to sign up. A wealth of information about preparing for a variety of disasters is available on the Thurston County Emergency Management website. If this information is valuable to you, and you would like to see more like it, please join the Griffin Neighborhood Association. If you own property, a business, or reside in the Griffin area, you are eligible to become a member of the Griffin Neighborhood Association. Click here for more information and to join online. Thank you! from the GNA. Posted in Disaster Preparedness, Griffin Neighborhood Association.